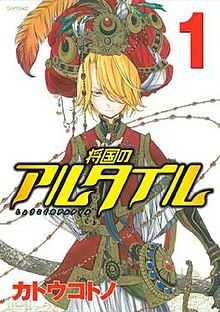 Altair: A Record of Battles (Japanese: 将国のアルタイル, Hepburn: Shōkoku no Altair) is a Japanese manga series written and illustrated by Kotono Katō about Tuğril Mahmut, a young military officer and his exploits to protect his country from invasion by a neighboring empire. It is serialized in Kodansha's Monthly Shōnen Sirius since July 2007. It won Best Shōnen Manga in the 41st Annual Kodansha Manga Awards. An anime television series produced by MAPPA aired from July 7 to December 22, 2017. Amazon Video streamed the series worldwide as it aired in Japan. Set in the western part of the great continent Rumeliana, Mahmut is a young war orphan and the youngest Pasha in the Türkiye stratocracy who desires to ensure that war never occurs. Unfortunately, after an assassination of a politician, Türkiye is under the looming threat of the militaristic Balt-Rhein Empire. After playing a vital role in solving two schemes within his country, Mahmut sets out on a journey to see more the outside world, only to witnesses Balt-Rhein's growing influence on the continent. To protect his homeland, Mahmut and his companions travel across West Rumeliana to form alliances between his country and the other nations to face against the Balt-Rhein Empire and their frightening expansionist movement. With the creation of the Tripartite Military Alliance with Greater Türkiye, Republic of Venedik, and Urado Kingdom, and the cooperation of the Cuore Alliance, the Anti-Imperial Alliance battles against the Balt-Rhein Empire in the Great Rumeliana War. Altair: A Record of Battles was first published in the July 2007 issue of the shōnen manga magazine Monthly Shōnen Sirius, published by Kodansha. Kodansha's North American subsidiary Kodansha USA announced that it will release the series in English via its digital platform, starting on March 21, 2017. In December 2016, Aniplex opened a website announcing that Kazuhiro Furuhashi was directing a "Project Altair" anime series at MAPPA, but did not state any other specifics. Later that month, images from the official website of Monthly Shonen Sirius revealed that "Project Altair" was an adaptation of Altair: A Record of Battles. Script composition is handled by Noboru Takagi while Ryo Kawasaki composed the music. The series aired from July 7 to December 22, 2017, on MBS TV's "Animeism" programming block and ran for two cour (two quarters of a year). On June 29, 2017, it was announced that Amazon Video service will be exclusively streaming Altair: A Record of Battles in more than 200 countries worldwide, and its "Anime Strike" channel will simulcast the series as it airs in Japan. The anime series released the first Blu-ray/DVD set and its limited editions bundles with bonus booklet, a Soundtrack CD, and Drama CD on October 25, 2017. The second Blu-ray/DVD set and its limited editions bundles with bonus booklet, another Soundtrack CD, and DJCD of the series's Radio Broadcast was released on December 27, 2017. The third Blu-ray/DVD set and its limited editions bundles with bonus booklet, another Soundtrack CD, and another Drama CD was released on February 28, 2018. The fourth and final Blu-ray/DVD set and its limited editions bundles with bonus booklet, animation drawings, and another DJCD of the series's Radio Broadcast was released on April 25, 2018. The series inspired the Shōkoku no! four-panel manga on Sirius' official website in 2012. The Shōnen Sirius magazine also serialized Shiina Soga's Shōkoku no Altair-san (Altair of the Tiny Nation, 小国のアルタイルさん), a short, comedic chibi-styled manga from 2012 to 2013, with a total of 21 chapters and released in a single tankōbon volume. On August 26, 2017, a special chapter of Shōkoku no Altair-san was released in the October 2017 issue of the Monthly Shōnen Sirius magazine. Chapter 1: "Mahmut and the New Continent"
Chapter 2: "Mahmut and the Power of Empire"
Chapter 3: "Mahmut and Poison Pasha Hotpot"
Chapter 4: "Mahmut and his Eagle Companion"
Chapter 5: "Mahmut and Phoiníkē (Revised)"
Chapter 6: "Lelederik and the Taming of Empire"
Chapter 8: "Mahmut and Venedik, City of Beauty"
Chapter 9: "Mahmut and Poems of the New Continent"
Chapter 10: "Mahmut and the Heroes of the New Continent"
Chapter 11: "Balaban and the Power of Four"
Chapter 12: "Mahmut and the Mystery of Iskender"
Chapter 13: "Mahmut and Fashions of the New Continent"
Chapter 14: "Lelederik and the Cute Dolls"
Chapter 15: "Mahmut and a True Love Story"
Chapter 16: "Mahmut and Opening the Closed Country"
Chapter 17: "Mahmut and Opening the Closed Country 2"
Chapter 18: "Mahmut and Türkiye Love"
Chapter 19: "Konstantinos and Phoiníkē's Revival"
Chapter 20: "Zağanos and the Art of Shadowing"
Chapter 21: "Mahmut and New World"
Hirokazu Kobayashi (story) and Kotono Katō's sister, Chika Katō's (art), Shōkoku no Altair Kaiden Tōkoku no Subaru (将国のアルタイル嵬伝) spinoff series launched in January 2016 and is also published by Monthly Shōnen Sirius. The set far to the east of Rumeliana, where the more Asian-influence countries exist and takes roughly six months ahead of the main series. The plot focus on the island nation of Kusanagi, which has been annexed by the larger country of Çinili and fallen into ruin. The female protagonist, Subaru, masquerades as the nation's former prince and tries to leads a rebellion to free her country. The first compiled book volume of Shōkoku no Altair Kaiden Tōkoku no Subaru shipped on January 17, 2017. On November 29, 2014, Kotono Katō released an illustration book titled Milkazzar Altair The Shōkoku no Altair Illustration Gallery Book (ミルカザル・アルタイル　将国のアルタイルイラストギャラリーＢＯＯＫ) for Altair: A Record of Battles. On October 6, 2017, a new art book titled Shōkoku no Altair Artbook (画集 将国のアルタイル), containing over 170 illustrations, was released to mark a decade of serialisation. On August 9, 2017, an official fanbook titled Official Fanbook of Shōkoku no Altair Book of Stars (将国のアルタイル公式ファンブック　将星の書) was released, containing both illustrations, background, and characters profiles of the series. A preview of the booklet with rough sketches was released on June 26 in the Shōnen Sirius August 2017 Issue. ^ a b "Shōkoku no Altair Historical Fantasy Manga Gets TV Anime by MAPPA". Anime News Network. December 21, 2016. Retrieved April 3, 2017. ^ "41st Annual Kodansha Manga Awards' Winners Announced". Anime News Network. May 9, 2017. Retrieved May 9, 2017. ^ a b "Rock Band Sid Performs Altair: A Record of Battles Anime's Opening Song". Anime News Network. May 13, 2017. Retrieved May 13, 2017. ^ a b "Amazon Prime to Stream Animeism Shows Including Altair Worldwide". Anime News Network. June 7, 2017. Retrieved June 7, 2017. ^ "Kodansha USA to Release Hozuki's Coolheadedness, Altair, Museum, Blame! Academy Manga Digitally". Anime News Network. March 14, 2017. Retrieved April 3, 2017. ^ "MAPPA, Kazuhiro Furuhashi Reveal 'Project Altair' Anime". Anime News Network. December 15, 2016. Retrieved April 3, 2017. ^ "Altair: A Record of Battles Anime Reveals More Cast, July Premiere". Anime News Network. March 25, 2017. Retrieved April 3, 2017. ^ "Altair: A Record of Battles Anime Reveals New Promo Video, Key Visual". Anime News Network. March 25, 2017. Retrieved April 8, 2017. ^ "Altair: A Record of Battles Anime Casts Daisuke Ono, Kazuhiro Yamaji". Anime News Network. June 2, 2017. Retrieved June 2, 2017. ^ 「将国のアルタイル」Blu-ray&DVD BOX Vol.1　完全生産限定版 (in Japanese). Retrieved July 7, 2017. ^ "Aniplex Japan Sets 'Altair: A Record of Battles' Blu-ray Anime Releases". Retrieved August 14, 2017. ^ 「将国のアルタイル」Blu-ray&DVD BOX Vol.2　完全生産限定版 (in Japanese). Retrieved November 8, 2017. ^ 「将国のアルタイル」Blu-ray&DVD BOX Vol.3 完全生産限定版 (in Japanese). Retrieved December 27, 2017. ^ 「将国のアルタイル」Blu-ray&DVD BOX Vol.4　完全生産限定版 (in Japanese). Retrieved December 27, 2017. ^ "小国のアルタイルさん" (in Japanese). Kodansha. Retrieved April 8, 2017. ^ "Shōkoku no Altair TV Anime's 1st Promo Video Reveals Cast, Staff". Anime News Network. December 25, 2016. Retrieved May 25, 2017. ^ "Shōkoku no Altair-san Special Short". Retrieved August 25, 2017. ^ "小国のアルタイルさん" (in Japanese). Kodansha. Retrieved November 7, 2017. ^ "将国のアルタイル嵬伝" (in Japanese). Kodansha. Retrieved April 8, 2017. ^ "将国のアルタイル嵬伝／嶌国のスバル（１）" (in Japanese). Kodansha. Retrieved June 21, 2017. ^ "将国のアルタイル嵬伝／嶌国のスバル（２）" (in Japanese). Kodansha. Retrieved June 21, 2017. ^ "将国のアルタイル嵬伝／嶌国のスバル（３）" (in Japanese). Kodansha. Retrieved December 7, 2017. ^ "将国のアルタイル嵬伝／嶌国のスバル（４）" (in Japanese). Kodansha. Retrieved February 23, 2018. ^ "将国のアルタイル嵬伝／嶌国のスバル（５）" (in Japanese). Kodansha. Retrieved June 19, 2018. ^ "将国のアルタイル嵬伝／嶌国のスバル（６）" (in Japanese). Kodansha. Retrieved June 19, 2018. ^ "ミルカザル・アルタイル　将国のアルタイルイラストギャラリーＢＯＯＫ" (in Japanese). Kodansha. Retrieved April 8, 2017. ^ "画集　将国のアルタイル" (in Japanese). Kodansha. Retrieved October 9, 2017. ^ "将国のアルタイル公式ファンブック　将星の書". August 7, 2017. ^ "Official Twitter Announced Fanbook". June 15, 2017. This page was last edited on 5 February 2019, at 23:09 (UTC).